an "Omamori." New Year's worship involves praying for a wish, such as: business success, good health, luck with an opening, traffic safety, having a safe childbirth, marriage, great fortune, protection from disaster, or to seek further blessings from the holy spirits of the shrine or temple. Each shrine and temple has their own specialties, as well as an "Omamori,” of which you can get in shrines and temples. This year, 3.19 million people visited the Meijijngu temple, and 2.96 million people visited the Kawasakidaishi temple on New Year's Day to do New Year's worship and get their "Omamori" for 2009. If you have not gotten your "Omamori" yet, don't worry. It's never too late. You can get an “Omamori” at any shrine or temple at any season. There are various types of "Omamori" such as: "Hamaya," "Kumade," "Ema," and other small amulets. Each of them has a different good luck power. If you have your own business and wish to make it bigger, get a "Kumade." "Kumade" is dedicated to business success and family happiness. If you want protection from having bad luck and disaster, get a "Hamaya." Moreover, you can have great luck for finding your bride at the Imado Shrine. 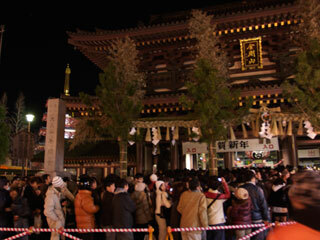 Yushima Tenjin is the most popular shrine for the education. Visit a shrine or a temple and get an "Omamori" for all you many wishes and good luck for year 2009! bring your "Omamori" back to the shrine and get new one for the year.